CND Shellac UV Gel Polish .25 oz - Star Struck Collection Holiday 2016 NEW!! Trending at $13.71eBay determines this price through a machine learned model of the product's sale prices within the last 90 days. 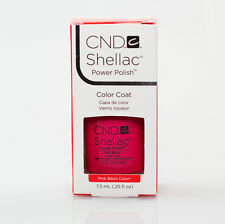 CND Shellac UV LED Gel Power Polish 7.3ml 0.25oz - Authentic - Choose Any Color! 5 out of 5 stars - CND Shellac UV LED Gel Power Polish 7.3ml 0.25oz - Authentic - Choose Any Color! 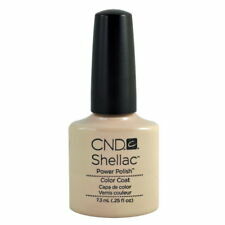 3 product ratings3 product ratings - CND Shellac UV LED Gel Power Polish 7.3ml 0.25oz - Authentic - Choose Any Color! CND SHELLAC Power Polish UV Gel Nail Color Coat *U PICK COLOR* Full Size! NEW!!! CND Shellac LED/UV Gel Polish Colors .25oz With Box PICK YOUR COLOR +Free Gift! CND NAIL SHELLAC POLISH. Shellac truly is a hybrid of traditional nail polish and UV gel polish. The colors are hypo-allergenic, and “3-Free” – no formaldehyde, toluene or DBP. The formula is thin and flexible like polish, so it not only looks natural, it provides strong natural nail protection with a resilient mirror finish that resists dullness and chipping for 2 weeks, even during the most rigorous activities. Provides a long-lasting color layer to nails. Provides a revolutionary new color service for nails. 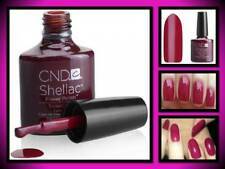 Provides 14-day wear..
Includes the following CND Shellac colors CND Base Coat. CND Xpress5 Top Coat. The color of the polish may vary from the computer and the actual bottle. Orangewood Stick. Kanga File. We promise we will work with you directly to resolve any issue you may have. CND Shellac UV Gel Polish .25 oz -WILD EARTH COLLECTION FALL 2018 NEW! 5 out of 5 stars - CND Shellac UV Gel Polish .25 oz -WILD EARTH COLLECTION FALL 2018 NEW! 1 product rating1 product ratings - CND Shellac UV Gel Polish .25 oz -WILD EARTH COLLECTION FALL 2018 NEW! The color of the polish may vary from the computer and the actual bottle. Item(s) must be in new and unused. We promise we will work with you directly to resolve any issue you may have. If there is a delay we will notify you shortly after you've placed your order. Trending at $13.49eBay determines this price through a machine learned model of the product's sale prices within the last 90 days. Trending at $14.46eBay determines this price through a machine learned model of the product's sale prices within the last 90 days. Directions: Shake to blend. After applying and curing Shellac Base Coat, apply a thin layer to all 5 nails. Cure for 2 minutes in the CND UV Lamp. Repeat on other hand. Follow with Shellac Top Coat. We would love to assist you and fix any problems you may have with the item. CND Shellac Ripe Guava LED/UV Gel Polish .25oz New With Box + BONUS ITEM! CND Shellac "Ripe Guava". Directions: Shake to blend. After applying and curing Shellac Base Coat, apply a thin layer to all 5 nails. Cure for 2 minutes in the CND UV Lamp. Repeat on other hand. Follow with Shellac Top Coat.